When the sugar cane and fruit companies needed laborers to work their plantations in Hawaii, they turned to indentured servitude. In return for 3 years' work on the plantation, a company would pay for the laborer's transportation to Hawaii and provide housing. My great-great-uncle, Francisco Peres Salado, arrived in just that manner. You can see him on line 3 of the S.S. Heliopolis manifesto, along with his nieces Rafaela and Amalia Anaya (later Ponce) on lines 1–2. My great-grandmother, Maria Anaya Ponce, also was aboard but does not appear on this page of the manifest. My name is Antonio Moreno Hurtado. A member of my family, calle Dolores Moreno Vera , from Cabra, sailed in 1907 for Hawaii. She was married and became widow there, marrying Juan Gutierrez in Honolulu on 1913, 03, 2 nd. I have got no news of my family since then. Could you help me, please?. Hello, Antonio, and thanks for visiting. 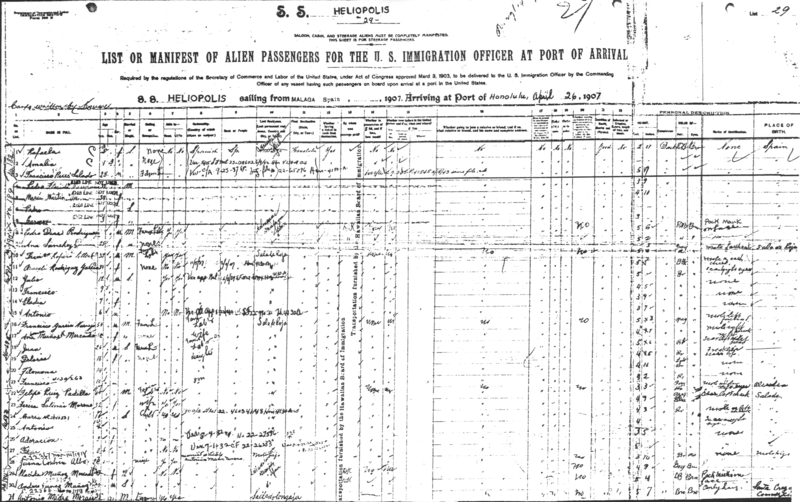 The passenger list for the SS Heliopolis is available at http://heliopolis-malaga.blogspot.com/2011/05/1907-heliopolis-index-from-pgs.html. You may be able to find records from your family’s time in Hawaii at https://familysearch.org/wiki/en/Hawaii_Genealogy. Good luck!